For this month's "Maps of the Month" featurette, I wish to draw your attention to JonLeung's The Legend Of Zelda: Oracle Of Hours (GBC) maps. The third game in The Legend Of Zelda: Oracle series for the Game Boy Color is finally mapped! In this game, Link finds himself in the land of Falsia, where he meets Farore, who turns out to be the Oracle of Hours, responsible for the movement of the sun and moon. An evil entity named Proodyl captures Farore, threatening to cause an eclipse to fully awaken its evil energies, and Link sets off on another adventure to save a doomed world! Like the companion games, Oracle Of Ages and Oracle Of Seasons, this new world also has different states. Whereas Labrynna has two time periods and Holodrum has four seasons, Falsia has both day and night. During the day, flowers are open, the tide is low, and gargoyle statues block paths; during the night, flowers are closed, the tide is high, and gargoyles come alive, among other things. Once Link obtains the Lamp Of Hours, he is able to use its captured sunlight to light (or extinguish) the Moon Lanterns to switch between day and night in order to traverse Falsia and make his way to Proodyl's Fortress to rescue Farore. And just like the other games, the true ending comes if you've finished one of the other Oracle games and continued with a Linked Game. Two years after Revned's mapping of Oracle Of Ages (January 2006) and TerraEsperZ's mapping of Oracle Of Seasons (February 2006), the three Zelda Oracle games are now complete! As Link knows very well, it's always just a matter of time. 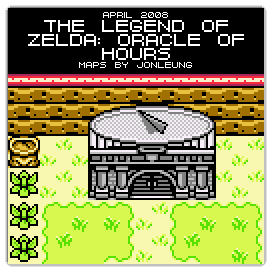 So to recognize the effort put into finishing off the "Triforce Trilogy", JonLeung's The Legend Of Zelda: Oracle Of Hours maps will be known as VGMaps.com's Maps of the Month for April 2008. I personally would rate this game somewhere between Ages and Seasons. The decision to consolidate the overworld into two maps with relatively minor changes helped make exploration easier (and more fun), and also made the game feel more cohesive, unlike the other two games. Even to this day I still think that Subrosia feels "tacked on" in a sense. On the other hand, I feel like the game has some really tedious dungeons. I for the life of me could not figure out how the Portal Cube was supposed to work. It's really a pity that nobody bothered to map this game earlier. Despite being an excellent game, it just seems to me that it always seemed to me that nobody paid much attention to it. Maybe people thought that buying 2 of the games would be enough. At long last. The first two Oracle games were a bit sloppy in presentation and clumsy in execution. This one, however, delivers--Farore's time to shine! I'm really glad you mapped this one, Jon. Kudos! YES, THIS IS AN APRIL FOOLS' DAY JOKE. THIS GAME DOES NOT EXIST. Thanks to those of you guys playing along. This game is based on how Nintendo had originally planned Oracle Of Ages and Oracle Of Seasons to have been a trilogy, with each part concerned with each of the three goddesses/oracles of the Zelda universe. The third part would've had Farore in the role that Din and Nayru had in Ages and Seasons, and it supposedly would've had to do with the times of day, hence the Day and Night versions of this world. RT-55J came up with the idea in December 2006, and it was originally to be the joke for April Fools' Day 2007. The brainstorming on this project started about then, (see the original topic here) but most of the work on this was done by myself beginning in December 2007. More detail on that process later. Now that you guys know it's a joke for sure (for those of you who didn't know), do you like it any more or less? I think it's absolutely wonderful. I was waiting to see what you'd come up with this year. I was also waiting to comment cause I couldn't think of anything witty enough to play along with. You've outdone yourself yet again with a completely believable map, and quite a believable story (at least to those who didn't follow the other two games as closely as others did, heh). So... it's now 11:33 in my timezone of UTC+1, so it must be something like .... 6:33 or whatever where you are... or maybe 5:33 or 7:33 or something like that.... and the maps still up? The maps will not be taken down. There probably will be people who see the OoH maps on the site and ask us where we got the rom. Just wait and see. I have a hard time finding the other April Fools map sets because they are in their own April Fools sections. Any chance that they will be moved to the main sections like OoH? Joke maps are the Maps Of The Month for all of April. After the work put into each one, I'm not going to let it be there for only one day and then put up some other Maps Of The Month that only get 29 days, what a gyp that would be (leap year Februaries aside)! I put Oracle Of Hours in the Game Boy (Color) section for more "believability", plus it sits nicely between the real Oracle games. But at some point I'll move it onto a separate page, as the other ones are. I'm guessing no one's yet figured out the significance of the names FALSIA and PROODYL? No, but I'm certainly curious now! Haha, Falsia and Proodyl spell "April Fools" when the letters are rearranged . Nice one Jon. I like the OoH maps there. It makes the GBC page seem complete. Now all we need is for somebody to create a level editor for the other two games so we can hack this into existence. Funny enough, I was showing this to some of my friends yesterday, and they all said that they would like to see it made into a fangame/hack. If we make the maps popular enough, it will probably be made into some type of real game.